Celebrating Davison Client Jennifer’s Product in The Container Store! “It’s just another wonderful example of how an idea comes to be!” said founder Mr. George Davison (“Mr. 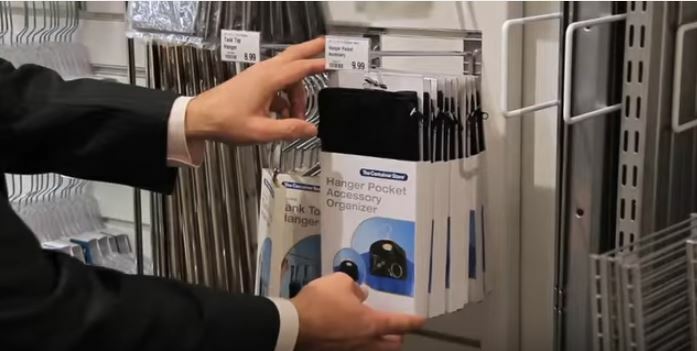 D”), excited to venture to The Container Store following great news for Davison client Jennifer’s Hanger Pocket Accessory Organizer product, which keeps clothes and accessories neatly organized. “We found out that the product has also been private-labeled by The Container Store!” said Mr. D, noting that Jennifer’s Hanger Pockets have already found success in versions available through other stores. Upon learning this news, Mr. D took a special trip to The Container Store’s Pittsburgh, PA location, which opened last October, following a private preview party. It was an exciting moment for Mr. D at the store as he prepared to give a special shout to Jennifer on the success of her invention idea. Congratulations again to Davison client Jennifer on her idea reaching yet another store shelf! Do you have an invention idea? Confidentially submit your idea today. The typical project is not licensed, sold in stores or profitable. The client has not realized a net profit on this product. IHHS 2016 Here We Come! When Should I Promote My Product on Social Media?